Month 2 of our Toyark Experience beta project has come to a close, and we have our winners! First place goes to Fortune – who won a MISB G.I. Joe Sky Striker. Second place went to Peteparker who won a NYCC Compound Hulk. Third Place went to BlackMagnus who won a copy of the NYCC Unit-E Comic Book. 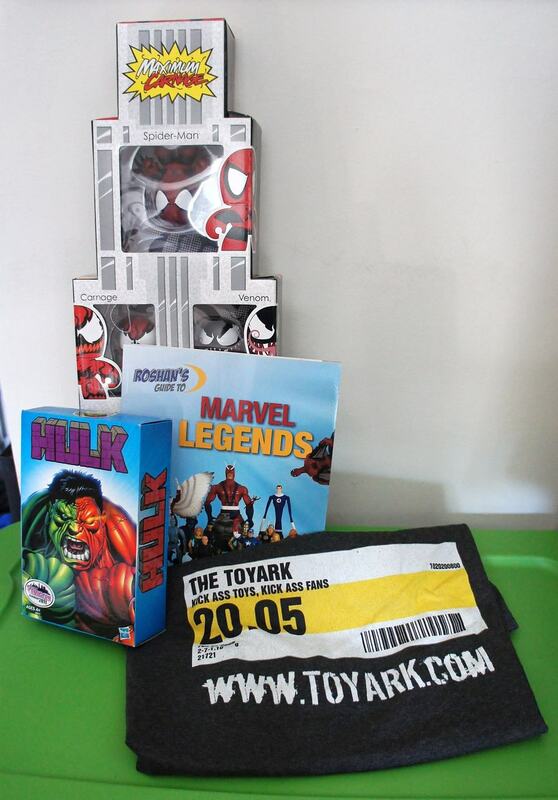 November is here and the grand prize for this month is a Marvel Super Pack – NYCC Mini Muggs Maximum Carnage Set, NYCC Compound Hulk, AND a copy of Roshan’s Guide to Marvel Legends! Second and Third places will also be NYCC exclusives – we will announce what they are on December 1st, along with the winners! For those that don’t know or remember, the Toyark Experience Activity score is looked at on the first of each month, and the top 3 active users at that time win free stuff. The members who won last month are not eligible this month, so it’s wide open again. Plus – the score is calculated based on the last 30 days of activity only, so you don’t have to be a veteran or previous regular to try your luck. All you need to do is sign up, and post regularly, and you could win this month! “Activity” is calculated by looking at the average posts per day, combined with consecutive days online. Be online every day, logged in, and post a lot, and that’s it! We’d like to thank Roshan for hooking us up with a copy of the guide that we will give away. It’s currently out of stock at Amazon, but keep an eye on the page for when it comes back in and grab your copy! Thanks for visiting, good luck in November! 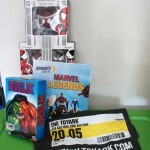 First Place Prize for November 2011 - Marvel Super Pack - NYCC Mini Muggs Maximum Carnage Set, NYCC Compound Hulk, AND a copy of Roshan's Guide to Marvel Legends! First place goes to Fortune - who won a MISB G.I. Joe Sky Striker. Thanks, congratulations and good luck! Congrats to the winners. Best of luck to everyone else for next month. Congrats BlackMagnus for being one of the best members here. Congrats Magnus and Peter you guys have been real cool in the short time I've been here. Good luck to everyone next month. Congrats all. And I agree, BlackMagnus is a real American hero. Is anyone declining the free toys this month? If I win I'll give them away to another Arker, just like in September. Congrats to the winners, ALL of them. A special congratulations to Fortune; who is Fortune's greatest son. "The Staff can manually assign points to you, for example as special thanks. Negative values are also possible." It's a part of the system that has been there since it was installed. Thanks guys, it means the world to me that you feel that way and hold me in that regard. I'm happy to be a part of a smaller, tighter knit community filled will great people. So, thank you. I dont remember that being an actual part of the introduction to this. Was it put out during the introduction of this contest? I thought the only specifications were post count and time spent on site? Maybe im wrong but im not sure. It's a part of the system itself. Been there since day one. It doesn't look like it has ever been utilized unfortunately. Well, that's a double edged sword I don't plan on touching any time soon, if ever. While some people may feel they deserve extra points, there are those that would equally deserve to have points deducted. Also, this avoids claims of playing favorites to those that get any extra points and cries of foul play when we deduce points. I was wondering exactly how this works? Do you pass a specific point ammount and enter a random drawing? or is it the top top guy, and if so, does that mean it resets every month? I dont get it. I think there's a giant wheel with the twenty newest members on it,.. the site admin spins the wheel on the last day of each month to determine a winner. That's kind of silly in my opinion. We should be able to assign points whether they are positive or negative to each member (not to yourself) and that should decide who the weekly winners are. Ive already said this in the past and I know how certain mods feel about this. It works for other forums that use it and really shows who the true contributers to a forum are besides post count. Not sure why it'd be a popularity contest as that had been pointed out before, if anything its better to be a popularity contest than a contest for who posts the most. I may be a bit biased cuz I am a newbie or whatever but I dont think a user based popularity contest would be fair as it would not allow new people to win. I mean clearly people would vote for someone like you (who they have known for a long time) then someone like me whos new. I just think it should based on some sort of concrete fact based mod controlled system that everyone knows exactly what they will be graded and awarded for. I agree. This whole points system can be a good thing and bad. As long as the mods have control over it, there shouldn't be a real issue with it. It's just a matter of who has time to post every chance they get vs someone who casually checks the site out.